Some of the strongest concerns this article raises relate to certain parts of the country and about driving a car. Hence, we would recommend that you avoid those states and that you do not drive a car in Mexico. Where you go and how you behave are the primary considerations; random acts of violence can affect us in our own country and abroad. We are pleased to note that there are currently NO TRAVEL ADVISORIES ABOUT THE STATE OF OAXACA coming from the State Department. Oaxaca city doesn’t have an embassy (only in Mexico City) or a consulate, but there is a consular agency: on Macedonio Alcala No. 407, Interior 20; telephone (011) (52) (951) 514-3054 or (011) (52) (951) 516-2853. Perhaps some articles are part of a campaign to boost tourism (economic motive), but what they describe is not out of line with our experience. Also, the last article listed here has some good tips about what to avoid and how to behave that are useful. 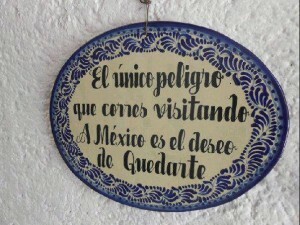 “The only risk you run visiting Mexico is the desire to stay.” Overstated, but a valid sentiment. From Facebook, June 28, 2013. Over the past few years, a small number of prospective applicants have raised a question about the relative security of Oaxaca, given the risks in the border zones, such as Ciudad Juárez. Mexico is a large country, and conditions vary greatly from region to region. Naturally, we are watching the scene in Oaxaca very carefully. If we have to cancel the institute we will do that, but we are hoping things remain relatively calm, as they are in Oaxaca currently. Above all, we ask that you assess your own safety and take precautions. The University of Oregon, which is administering the NEH grant, requires a liability waiver from each of you, and asks that you purchase insurance (for health coverage and emergency evacuation in the case of a natural disaster or political crisis). Here is the link for getting the insurance: https://app.smartsheet.com/b/form?EQBCT=1193ccf7c48844aa825e80302d4b04a2 (for these purposes you are a “student” — but they tell me that you can leave the student ID number blank). We are happy to report that in all three of our NEH Summer Institutes in Oaxaca the unanimous feeling has been that we were very comfortable with the fairly calm political climate, our secure spaces, our safe practices, and our contingency plans. But, the bottom line is that we cannot guarantee your safety, and so if you come with us, it will be at your own risk. SAFETY IN NUMBERS. Whenever possible use a buddy system rather than walking or taking a taxi alone, especially on lonely streets and at night. Stay on the beaten path when alone. But also watch out when a street is very crowded, as that can be when pickpockets will be at work. DOCUMENTS. Scan your passport and other travel documents (including your itinerary) and email them to yourself and someone who will be at home. Don’t share details about your travel plans (or your room number or address) with strangers you meet. SAFES. Some lodging facilities will have a safe where you can store valuables, and some will not. You can try punching in 0000 to see if your safe will open with this simple code that a thief could also use; sometimes this is the case, and it renders the safe, well, not safe! You will have to weigh whether to keep things on your person or in your room/apartment. Lock your windows, balcony doors, etc., at night and when you are not home. VALUABLES. Consider whether you really need to bring with you to Oaxaca certain valuables (diamonds, gold chains, and other things that might attract the attention of thieves). It might be a good idea to leave them home. CAMERAS. Pocket-sized digital cameras can now take high quality photos and they can be kept largely out of sight. A large fancy camera is an attraction for thieves and will mark you as a tourist. CELL PHONES. Consider whether you will need your U.S. cell phone (will you be getting an international calling plan?). If you do bring a smart phone or other desirable technical gadget (tablet, iPad, etc. ), try to keep it out of sight at all times when in public. We had an NEH Summer Scholar in 2014 whose phone was grabbed right out of her hand on the street — the guy ran off faster than an Olympic racer. She also had an ID and a credit card tucked into the phone’s case. Major hassle. FRONT POCKETS. Consider keeping your wallet or other valuables in your front pocket. BACKPACKS. Consider wearing a backpack on your chest when in a crowded place. Always be sure it is zipped up. Keep the most valuable things deep and close to your body. MONEY BELTS. These can be around your waist, your neck, or in a sock; they come in many varieties. They can carry the passport, extra cash, and an extra credit card. Be careful not to be too public about accessing your money belt, such as right next to an ATM, where someone might be watching for clues as to where you hide your valuables. ATMS. Use ATMs in the daylight hours, and look for ATMs that are inside pharmacies or supermarkets. Stick to ATMs that are affiliated with national or international banks. Banks will sometimes have small rooms where you can get off the street while you are using an ATM, but assess the situation carefully before you take out your card. Have a buddy with you when you stop at an ATM, to help you keep an eye out for suspicious characters. CREDIT/DEBIT CARDS. Write down card numbers and the phone numbers on the back so you will know how to call and cancel cards that get lost or stolen. An international telephone number is better than an 800 number. The 800 number will not necessarily work from a Mexican phone. Inform your bank with your locations of travel and your dates so that they won’t freeze your accounts. An extra card can be very helpful if an ATM swallows your card. APPEARANCE. Shorts and flip-flops shout “tourist.” Try to blend in when in the city and in small rural towns. If you go to the beach on a weekend, that might be different. Women might also try to avoid sexually revealing clothing (short skirts, low-cut tops) that could be seen as inviting (probably unwanted) attention. ALCOHOL. Drinking will lower your ability to assess dangers. So, drink only in moderation and always leave a bar only with a trusted friend, not someone you have just met. Women should not accept drinks from men they don’t know; such drinks have sometimes been tampered with. PUBLIC BUSES. These are relatively safe, but watch your back pocket and bags when climbing onto a bus or when having to stand in a crowded bus aisle. Know that some pickpockets work in pairs; one distracts you while the other is stealing from you. NEIGHBORHOODS. Find out which neighborhoods are safer than others. Your landlord and hotel managers can be helpful in this way. Our housing page outlines the historic center, which is where you will be safest. JOGGING ON THE CERRO DEL FORTIN. We have heard several stories that the stairway to the Fortín (where the Guelaguetza stadium is located) is not a safe place for a woman alone. If you go up to the stadium, go with friends. Also, jogging on the hill there (the “Cerro del Fortín”), where there is a trail that winds around a few kilometers, is not safe for a woman alone. Jogging with an iPod is a red flag. Having a cell phone out and obvious while jogging is also not advised. It is these items that people are after. TAXIS. Taxis are inexpensive and relatively safe in Oaxaca. From the airport, look for the “taxi autorizado” (authorized taxi), where you buy a ticket and ride with other people in a shuttle like situation. In town, those taxis that can be called by your hotel or that are parked at a “sitio” (stationary place) are more reliable, as they are usually part of a company that can be held accountable for improprieties. They will sometimes cost a small amount extra (less than a dollar). Share a cab with a buddy to save on costs. You will also find that going out to small towns can involve “colectivos” or “peseros” (collective taxis). This is where you pay the equivalent of about a dollar and ride along in a full car, where individuals are getting on and off along a set route. Again, here, we recommend that you take a collective taxi with a friend, rather than alone, especially if you are female. VOCABULARY. Learn key words or phrases in Spanish that might be helpful: emergencia (eh-mer-HEN-see-ah, “emergency”) and auxilio (ow-ZEEL-ee-oh, “help”).